When Apple introduced System 7—way back in 1991—one of its most-notable features was quick and simple folder sharing with anyone on your network. Just click a folder, enable sharing, define which users would have access to the folder, and you were done. OS X, of course, has had various forms of folder sharing since its inception. None, however, were (at least in my opinion) as easy to use or understand as was file sharing in System 7. Now, a mere 16 years later, OS X 10.5 finally brings back fast and easy file sharing. Prior to the release of OS X 10.5, setting up file sharing was doable, but far from simple. In Leopard, though, it’s almost as simple as it was in the System 7 days—you don’t even need to visit the Accounts System Preferences panel, for instance. This will pop up another dialog box where you enter a user name and a password (entered twice for confirmation). Once you’ve filled that data in, click Create Account. Bingo, instant file-sharing user! Now just highlight that new person on the right-hand side of the window, and click Select. You’ve now shared the chosen folder with the newly-created user. 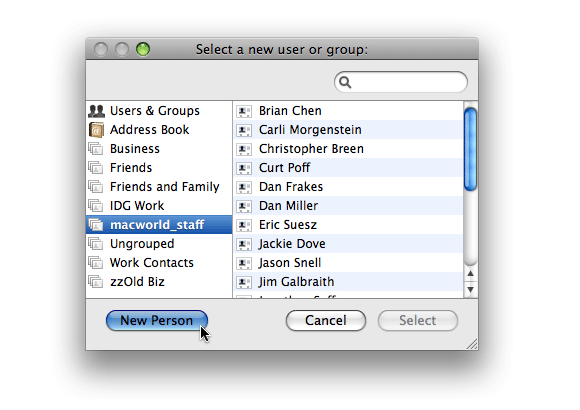 The users you create in this manner are folder sharing only users—they cannot walk up to your OS X machine and login; they exist only in the realm of folder sharing. These accounts do, however, show up in the Accounts System Preferences’ panel, where you’ll see them labeled as Sharing Only. You can, in fact, delete users using the Accounts System Preferences panel, if you want—before you do so, however, you should first remove them from any shared folders—if you don’t, you run into a bit of a bug with OS X 10.5. If you delete a user who still has rights to a shared folder, they will be replaced on that folder with a somewhat-troublesome “unknown” entry in the Sharing & Permissions section of the Get Info window—where the user’s name used to be, you’ll see “unknown” instead. Normally, you can use the minus sign to remove file sharing entries in the Get Info window, but not for “unknown” users. For whatever reason (Bug? Feature? ), nothing at all happens if you highlight “unknown” and click the minus sign. To remove these entries, you basically have to duplicate what you did originally: recreate the file sharing user, assign them to the chosen folder, then use the minus sign to delete their entry. While I think System 7 still has something on OS X 10.5 for ease of folder sharing, this new method isn’t bad at all—and it’s miles better than anything we’ve had in prior OS X releases.